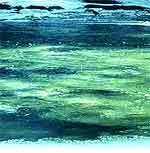 anchor ice - Submerged ice attached or anchored to the river bed, irrespective of the nature of its formation. blizzard - winds of at least 35 miles per hour along with considerable falling and/or blowing snow reducing visibility to less than one-quarter mile for a period of at least three hours. border ice - ice formed along and fastened to the shore. Border ice does not extend the entire width across the river. Also called shore ice. breakup jam- accumulation of broken ice pieces that restricts the flow of water; may contain frazil ice or remnants of freezeup jam. candled ice - decayed sheet ice that takes the appearance of thin vertical crystals shaped like candles. dendrite - hexagonal ice crystals with complex and often fernlike branches. 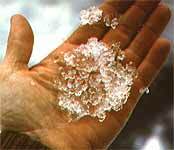 graupel - snowflakes that become rounded pellets due to riming. Typical sizes are two to five millimeters in diameter (0.1 to 0.2 inches). Graupel is sometimes mistaken for hail. 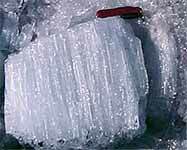 ice I through ice IVX - different crystalline arrangements that form under various temperature-pressure situations. Read all about the potential hazards of ice IX in Kurt Vonnegut's novel "Cat's Cradle". pipkrake - needle-like spicules of ice that grow out of the groundwater from moist, loose soil when there is no freezing in the ground; needles are about 1mm in diameter and can be several centimeters tall.